A glorious slice of fantasy cinema in its purest form, A Wrinkle in Time revels delightedly in the traditions of the genre while delivering a thoroughly modern message. And although it may be unashamedly sentimental at points – this is Disney, after all – it never descends into mawkishness, because the real-world emotions on which it is built are solid, and universal. For headstrong, mixed-race 13-year-old Meg (the utterly charming Storm Reid), the usual raft of adolescent issues – a school bully, hating her appearance, struggling to find her niche in life – have been exacerbated by the disappearance of her NASA scientist father (Chris Pine) four years before. When her precocious younger brother Charles Wallace (Deric McCabe) introduces her to three magical women, Mrs Whatsit, Mrs Who and Mrs Which (Reese Witherspoon, Mindy Kaling and Oprah Winfrey, all brilliant), Meg finds herself thrust on a planet-hopping adventure to rescue her missing parent. In adapting the 1962 novel by Madeleine L'Engle, screenwriters Jennifer Lee and Jeff Stockwell and director Ava DuVernay have adopted a straightforward 'good overcomes evil' approach. Despite all the universe jumping – done by 'tessering', a method of folding space and time discovered by Meg's father and her mother (Gugu Mbatha-Raw), also a brilliant scientist — the world building is visually stunning but deliberately simple; good places are lush and green, bad places are shadowy and foreboding. Where the film really dares to be different is not just in its teen girl heroine, but also in the autonomous voice she has in her own story. She is allowed to be opinionated not just in her moments of courage and bravery – more to do with brain than brawn – but, crucially, in her many instances of self-doubt. For Meg, heroism does not come easily. Her journey from worrier to warrior is hard-fought, and her biggest nemesis is not those around her, nor the marauding 'It' – a growing dark entity that's threatening to destabilise the entire universe with fear and malice. Instead, Meg's low self-esteem proves her biggest hurdle, and watching her overcome herself – to acknowledge her flaws, to appreciate her differences, to realise that she is deserving of love – is thrilling and moving in equal measure. 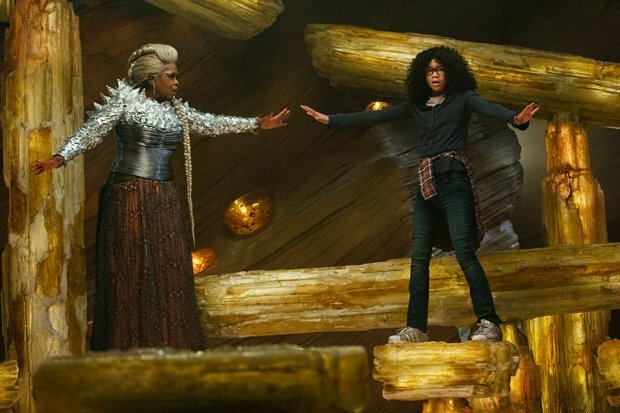 It would be all-to-easy to snark about A Wrinkle in Time; its heart-on-sleeve narrative, colourful aesthetic and thematic innocence hark back to more traditional family fare like The NeverEnding Story. But that is undoubtedly one of its strengths. With no complicated philosophy beyond the redemptive power of love and forgiveness, DuVernay and co have created a film that's a deliberate antidote to contemporary cynicism and inspirational viewing for young audiences, whatever their gender.